1. Dissolve salt in boiling water in a large bowl. 2. Add the remaining ingredients. 3. Stir and bring together as a dough. 4. Separate the dough into balls. 5. Colour individual balls with food colouring. 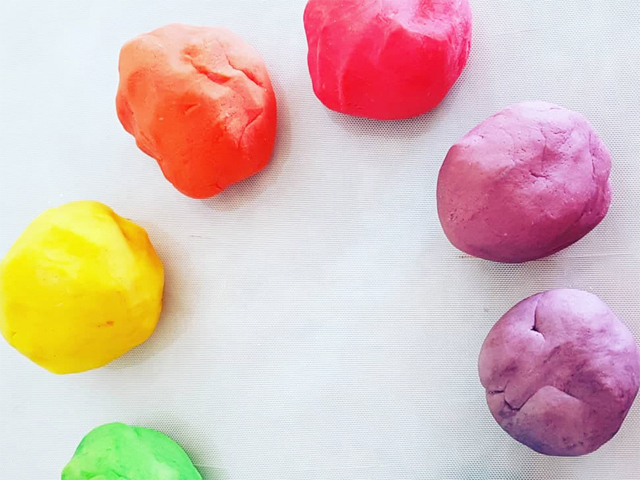 Roll play dough into snakes and cut with plastic (kid safe) scissors. This helps develop scissor control and kids love it! Use your favourite animal (plastic, wooden or LEGO) to push into the dough. Pull it out again to see what pattern (fossil) it has left behind. Hide your favourite animals, one at a time (plastic, wooden or LEGO) in a ball of dough. Give it to your little one with a few kitchen utensils to use as tools to dig out. Roll the dough into snakes and shape into a spiral to make a snail! This is great for strengthening FMS and hand-eye coordination. 5. Add Marbles + Squeeze! Add marbles or pebbles to the dough and roll into snakes. Pinch around the marbles to help build hand and finger strength.